After attending the launch of the Nokia N8 smartphone in Dubai, I got a chance to test-drive the new N8, which should be available in the market by the end of October. 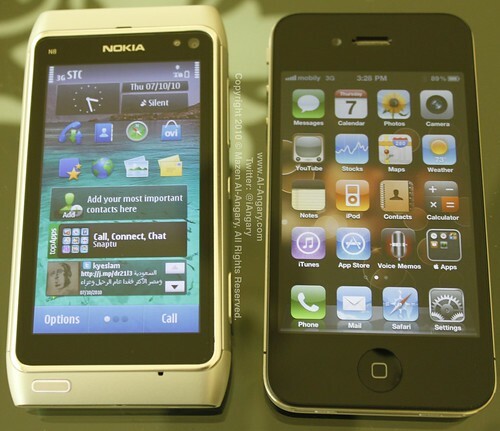 Reviewing such a device that packs in a lot of technology and the latest Symbian^3 operating system wasnâ€™t an easy task, yet when it comes to touch interface I thought of comparing it to something most of us can relate toâ€¦ The iPhone. Presumably I was one of the first people to get a look at the device when Nokia was still working on it, I even posted images I shot of the N8, which created a buzz-wave on the web (the images were picked up by many sites including Engadget and Nokia fan sites), because of that wave, I was asked by the company to remove the images from my blog and SaudiMac. This time around I was given a device ahead of its international official release date. 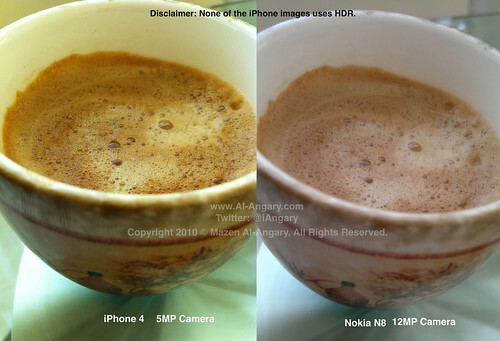 I asked Nokia representatives to give the device a non-biased review, I also told them that I will put it head to head against Appleâ€™s iPhone 4 when it comes to performance and image capturing quality. Before I get into the review, I should mention that I’ve been dealing directly with Nokia for many years now, reviewing many of their products. And what I can say about the company is that they are very professional, ethical, and listen to their customers all around the world. 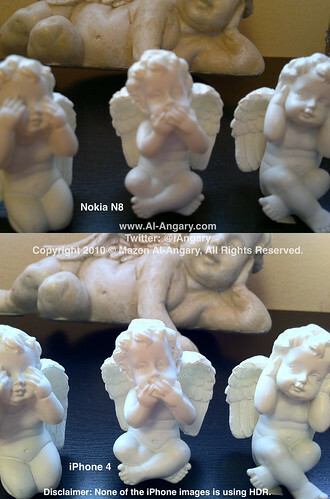 Nokia is one of those great company that values its core ethics. So to me they are one of the Good Guys, and I hope that this review will help improve future products. Although I didnâ€™t get the commercial box, yet Nokiaâ€™s site lists the same content I found. Inside the box you will find the N8 (of course), Nokia connectivity cable, Nokia stereo in-ear headset, compact travel charger, Nokia adapter cable for HDMI, adapter cable for USB, quick start guide, and manual. The Nokia N8 features a much welcomed anodized aluminum casing that comes in five colors; Silver white, Dark grey, Orange, Blue, and Green. A 3.5 inches capacitive touch screen with a ratio of 16:9 nHD (640 x 360 pixels), the N8 also sports an accelerometer, a compass, proximity sensor, and ambient light detector. The device comes with a 16GB internal memory with support for up to a 32GB MicroSD card. Plus many high-end technologies like Bluetooth 3.0, a-GPS, 3.5 mm AV connector, FM Radio, and HDMI port. 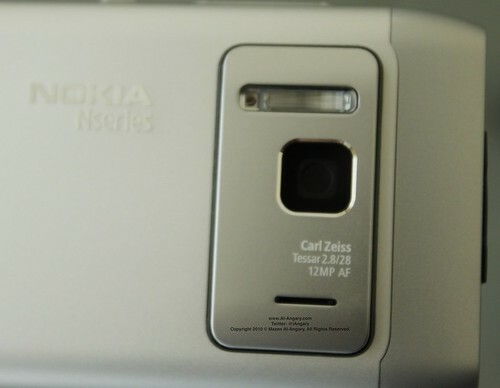 On the back you will find the 12MP Carl Zeiss camera lens, that can also shoot 720HD video. Since were are still at hardware, I should mention that the placement of the menu key isnâ€™t ergonomically comfortable, you tend to even miss that it is there at times especially if you are holding the N8 with your left hand. Nokia N8 runs Symbian^3, I wonâ€™t get into any geeky jargon here, instead all I can say is the device performance better than older Nokia models like the X6. That said, I think that Nokia could have done a better job, running the device next to a forth generation iPod touch would put it to shame, you can feel that the device gets slow at times. 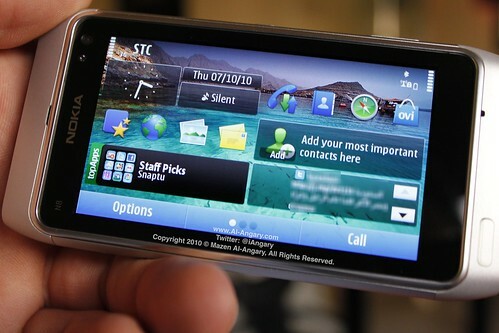 On the positive side, the new Symbian^3 offers three customizable home screens, unlike iOS, these screens can feature widgets that gather your social networks activities, your news feeds, and many useful shortcuts to launch apps or web links. I found this to be very useful when you want to see the most recent tweets, or friends posts on your FaceBook wall. 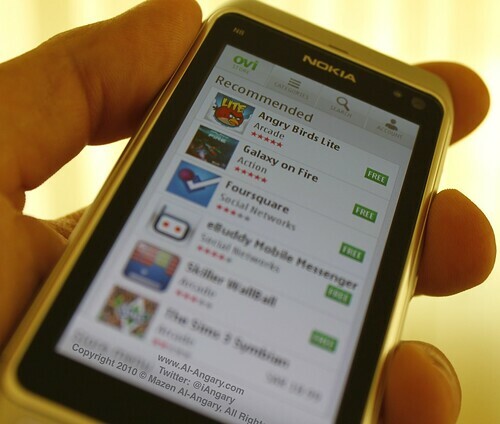 While Apple focused on apps or web links that can run from the home screen, Nokia offered both approaches, giving you the freedom to add apps, web links, and widgets. Overall, the device performs well for a phone, with cool on screen features, and customizable background for each screen separately. Adding elements to any screen is as easy as touching and holding the screen. Although the N8 is made of solid anodized aluminum casing (apart from the top and bottom plastic fittings), it feels light in hand, that could be both good and bad at the same time. It is good because if you are the type of person who wants a light smartphone, then this is it. Yet if you want to feel a solid device in hand, the N8 will give you a feeling of an inferior build quality, so as I said depends on which side of the fence you like to sit on. When the screen locked the great thing about the N8 is that it shows the clock, I have been using the device for a couple of days now, and didnâ€™t find a need to wear a watch because of this feature. This raises the question about battery life, as I said I used the N8 for a couple of days and burned almost half the battery. I wonâ€™t claim that I used it extensively to make many calls, but it was connected to both 3G and my WiFi network all the time, so it is fair to say that the battery life is quite impressive for a smartphone. Being able to connect the device to your HD TV and watch High-Def videos is a plus, I should mention that the iPhone (iPod touch and iPad) does the same if you are willing to pay extra for the required cables, Nokia offers such accessories right in the box. The N8 also supports Dolby Digital Plus, so that will guarantee a full movie experience, imagine traveling with this device loading it up with your favorite HD movies. Another cool feature is that with Nokia devices you can purchase apps and get billed through your carrier, so no need to use credit cards, or even prepaid cards. I downloaded Angry Birds from Ovi store, and found that it performs as well as its iPhone counterpart. 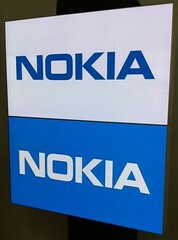 I have asked Nokia about Mac support, they said that they are working on it, so we might expect that soon. Overall the N8 is a big step above any Nokia phone, I can see a huge market for such a device, it has a lot to offer with all social networking capabilities, customizable home screens, and relatively familiar UI to older Nokia phones. But putting all the sugarcoating aside, the device was disappointing when it came to two things, the speed of launching apps and performance, and its camera performance, especially when it comes to using Nokia â€œBigger Pixelsâ€ and Carl Zeiss lenses. 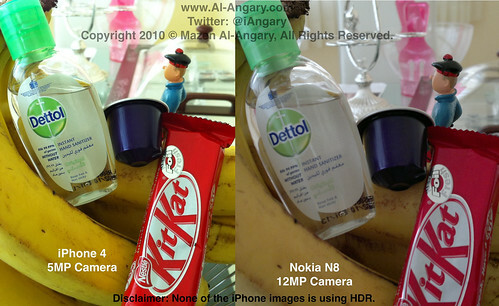 I took some photos with both the N8 (12MP camera) and the iPhone 4 (5MP camera), and will let you be the judge. (I should note that the full res images are available on my flickr page if youâ€™d like to take a closer look). 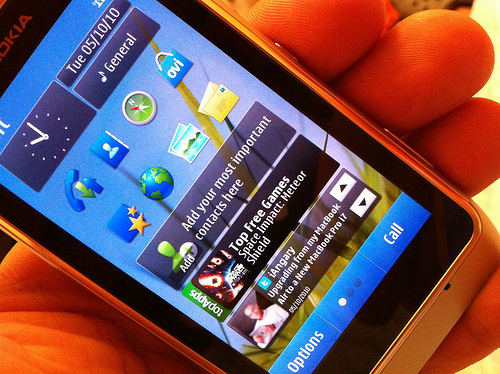 – Nokia is getting better at capacitive touch-screens. – Easy connectivity to emails, messaging, and social sites. – No more double tapping. Love that. – User Interface is still sluggish, although faster than the older OS. 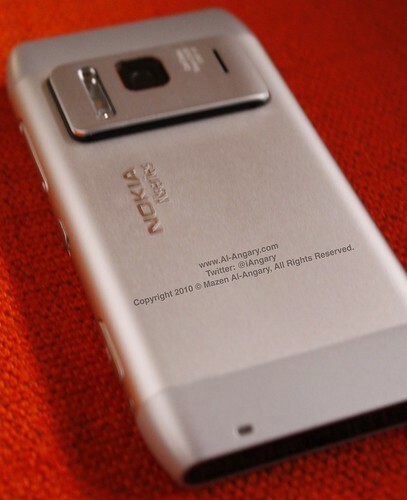 – The 12MP camera is lower than what I expected. – Menu key location makes it difficult to use at times. Package Content: 5 out of 5. Hardware 3.5 out of 5. UI & Software 3.5 out of 5. Experience 3.5 out of 5. Copyright 2010 Â© Mazen Al-Angary, All Rights Reserved. 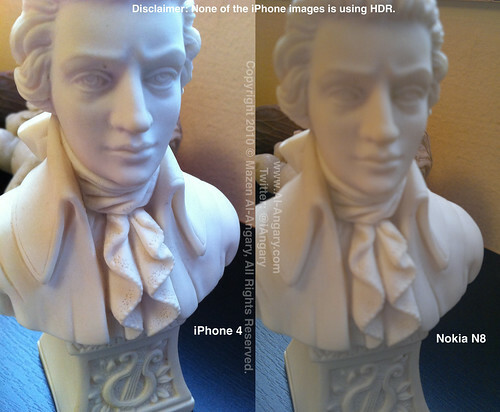 Edited shots for iPhone looks better than N8. 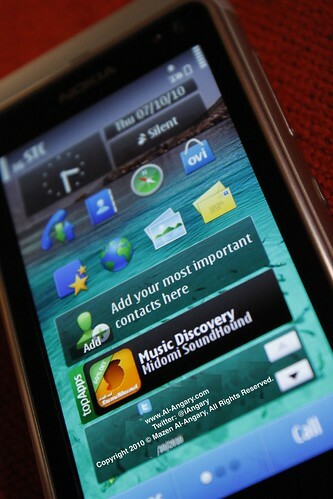 iv never been a fan of nokia phones, I found symbian os a bit dull & complicated sometimes. I don’t even like the design of N8 it’s not as sleek as the iPhone’s. & what’s with the 12MB camera! theoretically it shouldnt be as awful as the ones in the post! the iPhone camera really beats the N8’s camera a$$ lol. having an HDMI port is total awesomeness! but I wonder if the camera is capable of capturing good video qualities. also i’m LOVING the way u get billed through ur carrier when purchasing something from ovi store. Khalid, You mentioned everything except the price. 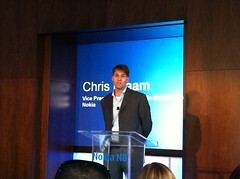 What is the price that nokia will be offering for N8? The price will be a major factor in deciding if N8 is a hit or a miss! or is it unable to focus macro? Use the macro option in N8 and youÂ´ll get amazing quality for your close-ups! Hi, I bought N8 few days ago because of it’s camera. 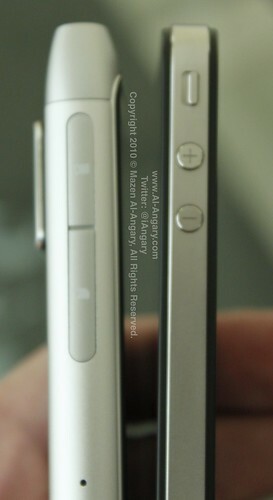 In generally it’s just fine, but I do miss optical zoom a bit. It’s the camera why I didn’t want the iPhone. If I want over saturated over contrast photos I can do it with a photo editing software, but I don’t want the camera to do it. Somehow most people seem to like over saturation more than natural colors, but It’s a matter of taste I quess ..
I’m ready to ditch my 3Gs for this phone. Been waiting 6 months for it. Wonder how much it will cost in Saudi (hopefully less than 2K). I love the iPhone but the reception is downright ridiculous. I’ve been getting angry emails since I bought this iPhone coz so many people could not get through to me. I hate having to carry a cheap Nokia just to get people to call me. 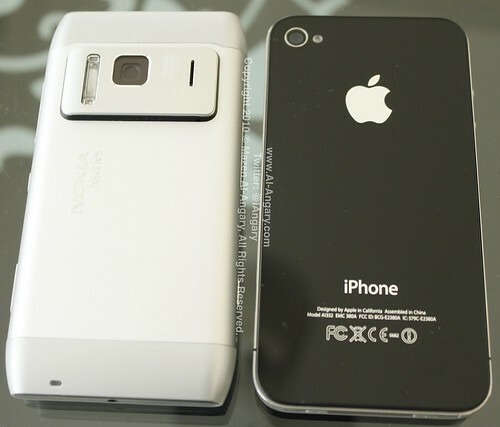 I think I’ll get an iTouch and an N8 … best of both worlds. Did you try the USB On the Go with the N8? This feature allows you to connect a USB drive (Thumbdrive, External Harddrive even another Nokia Phone) to the N8 and you will be able to access the contents of the device connected. So theoratically, you can connect a 1TB portable harddrive with all your movies in it and then connect it to N8, the N8 is then connected to your HD TV via the HDMI port and you instantly have a media player on your hand. Will be very handy when you’re travelling and staying in a hotel. Anyone knows when this is being released in Saudi? This feature is just awesome.